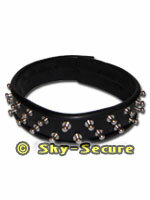 Leather collar made of high-quality genuine leathers with double rivet row. Pleasant stretcher comfort by its interior fodder from leather and by its padded edges. Size-adjustably.